The Liturgists are a global community working to subvert the barriers our society builds around religion, race, gender, ability, and sexuality. Our work is centered around compelling discussion, non-judgmental community, and thoughtful, evocative art. Currently, that work is expressed through a popular podcast called The Liturgists Podcast, hosting events world-wide for the spiritually estranged called The Liturgists Gathering, and producing liturgies, educational resources, and meditations for our community. 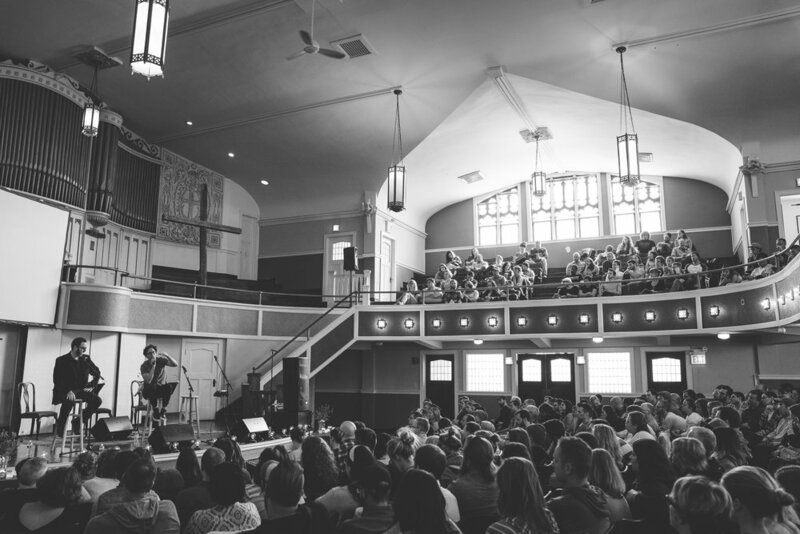 The Liturgists was born out of a friendship between two people: Michael Gungor and Mike McHargue. They both grew up in conservative Christian churches, and both lost their faith as adults–and they both rediscovered spirituality through philosophy and mysticism. They met in 2013 and experienced a mutual revelation as they shared their stories with each other: "it's not just me." Frustrated by the anti-science and socially regressive stances of mainstream American Christianity, the two founded The Liturgists in 2014 to produce thoughtful, evocative art for the spiritually homeless and frustrated. This work began as a series of liturgies, or guided contemplative worship experiences. Initially available as downloads online and produced in collaboration with compelling musicians, poets, and teachers, the liturgies grew into events that toured the USA. These liturgies were intended for people who felt "left out" of organized religion, but still had a longing for an encounter of some kind with the Divine--even if the very idea of God seemed absurd to many of them. These liturgies challenges conventional theological paradigms and celebrated the insights of science (without distorting it to fit a Christian narrative). The Liturgists discovered there was more interest in their work than in-person liturgies could reach, and a deeper desire for topical exploration than their downloadable liturgies could cover. So, in July of 2014, The Liturgists Podcast was launched to interpret the most pressing and relevant topics of our time through the lenses of art, science, and faith. The program grew quickly, from an audience of thousands to millions in the first year, and assembled an uncommonly religiously diverse audience including atheists, Christians from across the denomination spectrum, and people with no specific religious affiliation. The explosive growth of The Liturgist Podcast makes a statement: millions worldwide are frustrated by the culture wars of institutional Christianity, but long for spiritual transformation that enacts positive action and reform in the world. To aid in that transformation, The Liturgists has grown into a global movement of people united by a single idea: there is room at the table for all who are hungry. Today, everything The Liturgists do is about creating space for those recovering from spiritual trauma, and lifting up traditionally marginalized people as full and equal members of humanity. Michael Gungor is one half of Gungor, and is a co-host of The Liturgists Podcast. Michael is a Grammy nominated musician and composer who lives in Los Angeles, California. He leads the musical collective Gungor with his wife Lisa Gungor and is a co-founder of The Liturgists with Mike McHargue ('Science Mike'). Mike McHargue (better known as Science Mike) is an author, podcaster, and speaker who travels the world helping people understand the science of life's most profound and mundane experiences. His bestselling debut book, Finding God in the Waves, has helped thousands understand faith in the 21st century. Mike's the host of Ask Science Mike, and cohosts The Liturgists Podcast with his friend Michael Gungor. He's recently appeared before sold-out audiences in New York, Chicago, and London, and is a frequent contributor to RELEVANT magazine, Storyline, BioLogos, and The Washington Post. Mike lives in Los Angles, CA with his wife, Jenny, and two daughters.